The ToughBuilt GelFit Rocker Knee Pads redefine how professionals use their Knee Pads. This patented kneepad system allows the hard Rocker SnapShell to be removed entirely or interchanged with other SnapShells. Create the exact kneepad to fit every job. 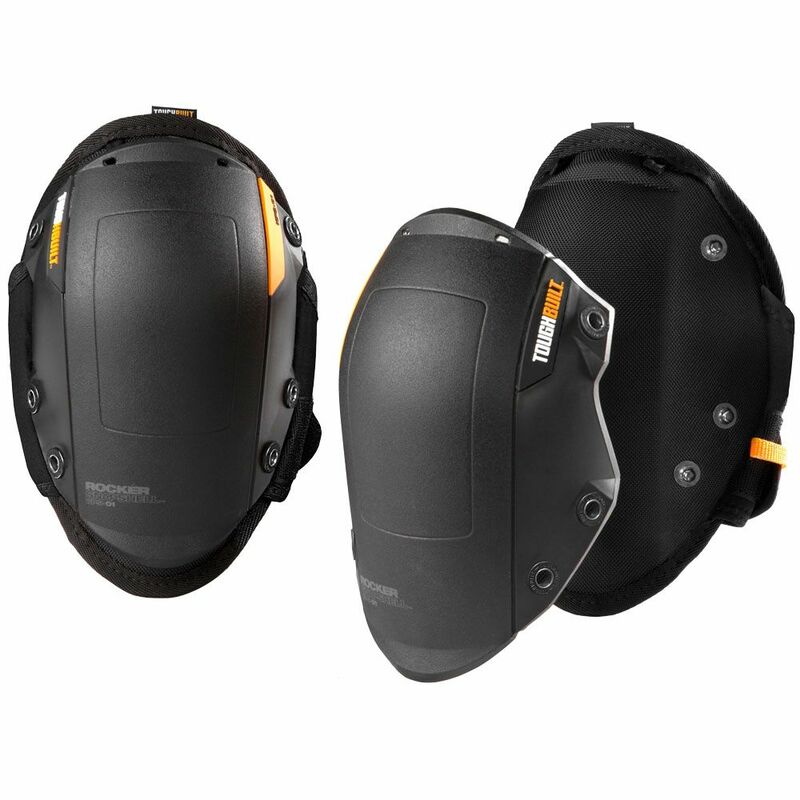 Hard-wearing, shatter-resistant SnapShell protects the knee on the roughest terrain while enabling easy side-to-side movement. Ergonomic gel and foam design embraces the natural shape of the knee and upper shin, maximizing pressure distribution for all-day comfort. High side walls greatly reduce twisting off of the knee. EVA elastic leg straps comfortably hold their place without cutting off circulation or binding behind the knee. Rugged materials and construction make these reliable Knee Pads withstand the most rigorous working conditions. GelFit Rocker Knee Pads (SnapShell compatible) The ToughBuilt GelFit Rocker Knee Pads redefine how professionals use their Knee Pads. This patented kneepad system allows the hard Rocker SnapShell to be removed entirely or interchanged with other SnapShells. Create the exact kneepad to fit every job. Hard-wearing, shatter-resistant SnapShell protects the knee on the roughest terrain while enabling easy side-to-side movement. Ergonomic gel and foam design embraces the natural shape of the knee and upper shin, maximizing pressure distribution for all-day comfort. High side walls greatly reduce twisting off of the knee. EVA elastic leg straps comfortably hold their place without cutting off circulation or binding behind the knee. Rugged materials and construction make these reliable Knee Pads withstand the most rigorous working conditions. GelFit Rocker Knee Pads (SnapShell compatible) is rated 4.6 out of 5 by 19. Rated 5 out of 5 by MrSmoker from As the name states, tough built! The order came on time and I was very happy with the quality of... As the name states, tough built! The order came on time and I was very happy with the quality of the product. One thing that is not mentioned clearly is they attach around your knee with two Velcro straps. That is, you do not have to put your foot through a loop and pull them up. Just wrap the Velcro around the knee. There is plenty of padding and the plastic outer layer is strong. Very comfortable to wear. Rated 4 out of 5 by Brian from Good quality and are very comfortable. My only complaint is... Good quality and are very comfortable. My only complaint is the fact that they tend to roll to the outside of my knee when I kneel down. If the shell had a slightly squared shape it would be better for my personal taste but that’s just my personal preference. Other than that I’m happy with them. Rated 5 out of 5 by Shareef from Simply the Best!!... Simply the Best!! Rated 5 out of 5 by Brady from another great product from toughbuilt! another great product from toughbuilt! Rated 5 out of 5 by MrUnhappy from Excellent knee protection. Snaps hold up very well. Best knee... Excellent knee protection. Snaps hold up very well. Best knee pads I've owned to date. Rated 3 out of 5 by GelKneeProtection from Home Depot misleading There are 2 versions of these. Twice in the description I read "secondary tension strap," which is like 1 'Y-shaped' strap. Then they sent me the model with 1 single strap. Home Depot, please supply front and back pictures of your products. Rated 4 out of 5 by Rick from Rocking knee pads I really like these knee pads. The gel makes them wonderful. I have bad knees and when the wife wanted wood floors, I put it off until I found a set of knee pads that would permit me to spend hours on my knees laying down the slats. The ones in the store were either too poorly made or too expensive. Like Goldie Locks these were just right. I completed the project and now use these pads when I need to be on my knees like gardening or plumbing tasks.